8 Easy steps How to Enable Remote Desktop in Windows 8? How to Remote Access Windows 8? Are you looking for simple ways to remotely access a Windows 8 computer? If so, then know that there’s a couple of solutions available for you already. In this article, we’ll show you different ways on how to remote access Windows 8. Remote access, or sometimes referred to as remote desktop, is a technology that allows users to connect to a remote computer from a distance. The goal of this technology is to eliminate the need for the physical presence of the user to get a task done. Once connected, the user can now access and control the remote device as if he is sitting in front of it. From there, he can run apps, manage updates, and even troubleshoot issues. As the years progress, remote access is becoming more common in a lot of industries these days. Modern businesses use this technology to maximize their efficiency and drive up their work productivity. This allows employees to address business demands even outside of working hours. On the other hand, IT help pros can also use this technology to provide off-site support and maintenance across various locations. Steps to Set up Remote Access Windows 8? How to Remote Access Windows 8 Step 4: Click Allow connections from computers running any version of Remote Desktop on the Remote tab. Note that the Remote tab can be found in the System Properties window. How to Remote Access Windows 8 Step 5: Click Select Users. How to Remote Access Windows 8 Step 6: Select Add. How to Remote Access Windows 8 Step 7: Type in your Windows username to access that computer remotely. How to Remote Access Windows 8 Step 8: Click OK. However, it is important to note that Windows RDC, in general, can only be used on the same network. You’ll need to expose your device directly to the internet to use Windows RDC on a different network. This option isn’t necessarily the safest as you’re inviting a bunch of security threats and risks found on the internet. 2. Remote Access Software – Another remote access solution we have on this list is remote access software. This tool, just like Windows RDC, provides users with the ability to access another computer remotely. 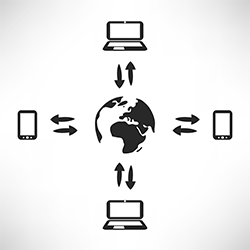 Typically, remote access software allows users to establish remote connections even on a different network. It is also a much safer alternative for Windows RDC as it uses solid encryption methods that conceal any confidential interaction made between the remote and local computers. How to Remote Access Windows 8 Benefit 1: It’s less complicated to use. How to Remote Access Windows 8 Benefit 2: You can access files and use apps on a remote device even outside of your local network. How to Remote Access Windows 8 Benefit 3: It’s very easy to download and install. How to Remote Access Windows 8 Benefit 4: With the help of an internet connection, you can pretty much use it from anywhere at any time. How to Remote Access Windows 8 Benefit 5: It’s one of the safest and most secure remote access solution out there. To sum it all up, remote access software can be the safest and most convenient option for you to access Windows 8 remotely. It is designed to provide you with an easy and secure remote access experience. Now that you know how to remote access Windows 8, then it’s time for you to use it for your own good and benefit. Does how to enable Remote Access in Windows 8 information is useful?